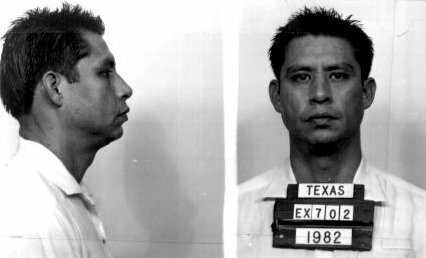 ExecutedToday.com » 1993: Leonel Herrera, perilously close to simple murder? Herrera’s sister Norma self-published this book about the case — keeping a promise to her executed brother. I am innocent, innocent, innocent. Make no mistake about this; I owe society nothing. Continue the struggle for human rights, helping those who are innocent, especially Mr. Graham. I am an innocent man, and something very wrong is taking place tonight. May God bless you all. I am ready. Well, Herrera wasn’t the first to go to his death maintaining his innocence. The circumstances (and circumstantial evidence) of the crime rate on the forgettable side. Years after Herrera was convicted and death-sentenced, multiple affidavits were produced to the effect that his late brother, Raul, was the real killer. This evidence was naturally pursued with gusto by the condemned man. Unfortunately, a claim like Herrera’s of “actual innocence” faces a very high bar when raised in appellate courts, once a prisoner has already been convicted and their presumption of innocence become a presumption of guilt. That this arbitrary rule of the game has a defensible rationale — could any criminal justice system operate if prisoners could continually relitigate their cases while memories fade and evidence ages into obsolescence? — does not make it the less Kafkaesque for individual prisoners, some of whom are in fact innocent. You already know how it ended. Chief Justice William Rehnquist’s opinion patiently explained a jurisprudential truism loftily uncolored by any experience in life liable to introduce a sense of kinship with a Hispanic man charged with a Texas cop-killing who uncovers too late the evidence that could save him. Instead, the Court recommended — tongue no doubt planted firmly in cheek — that Herrera apply for executive clemency, a dead letter procedure in Texas used exclusively in a good cop/bad cop routine opposite the black robes. Herrera himself may or may not have been innocent. At the end of the day, he went down because the game was rigged against him: his exculpatory evidence was not available at trial, when it might have introduced “reasonable doubt” — as Rehnquist’s opinion put it, “in state criminal proceedings the trial is the paramount event for determining the guilt or innocence of the defendant.” Once that evidence became available deep in the appeals process, it was procedurally barred, and far from such a slam-dunk exoneration that any institutional actor would stick his, her or its neck out to lift Leonel Torres Herrera from the gurney. Just as an execution without adequate safeguards is unacceptable, so too is an execution when the condemned prisoner can prove that he is innocent. The execution of a person who can show that he is innocent comes perilously close to simple murder. Whether “simple murder” happened in Huntsville this night in 1993, perhaps no one can really say with certainty. But as DNA evidence and other forensic advances in the intervening years have increasingly eroded confidence in the reliability of the justice system that metes out death, Herrera v. Collins stands as a key precedent in a case now before the Supreme Court — in which states (joined by the Obama administration) are asking the justices to agree that convicted prisoners have no right to cheap, simple, and frequently dispositive DNA testing that may not have been available when they were tried. Given the composition of the court (including three holdovers from the Herrera majority), that decision figures to have Leonel Herrera rolling over in his grave. * Rehnquist conceded a theoretical possibility that extraordinarily persuasive evidence could generate relief on due process grounds. Antonin Scalia and Clarence Thomas went much further, claiming that prisoners had no right to anything but their trial and their (procedural) appeals. Hello, this is a truly fascinating web weblog and ive loved reading numerous of the content and posts contained upon the web site, sustain the fantastic perform and hope to examine a great deal much more exciting content articles inside the time to arrive.